If you’ve been following the Ted Haggard scandal, you’ve got to read this article, published in May, 2005, in Harper’s Magazine. Soldiers of Christ has some of the most delicious and prescient ironies on Haggard that I’ve encountered while following this story. His true beliefs and desires were sitting right under everyone’s noses and in plain sight. Pastor Ted soon began upsetting the devil’s plans. He staked out gay bars, inviting men to come to his church…. He moved the church to a strip mall. There was a bar, a liquor store, New Life Church, a massage parlor. What better way to relax after a day of proselytizing than over drinks and a massage? As they say, one of the keys to a successful business is location! Haggard mentioned in his letter to his former chuch that he’s been warring against the “dark and repulsive parts of him” for all of his adult life. 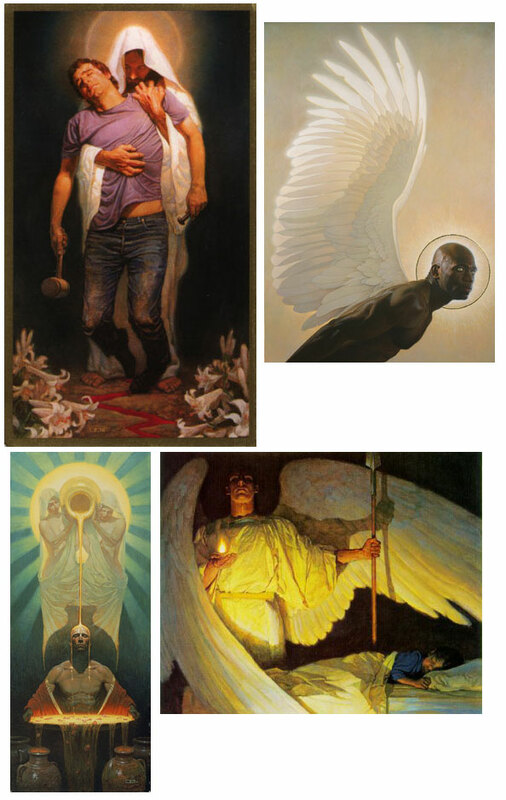 It must not have helped that he adorned his New Life Church with artwork adorning the New Life Church heretempting images of beefcake men in sexually charged positions. The atrium is a soaring foyer adorned with the flags of the nations and guarded by another bronze warrior angel, a scowling, bearded type with massive biceps and, again, a sword. The angel’s pedestal stands at the center of a great, eight-pointed compass laid out in muted red, white, and blue-black stone. Each point directs the eye to a contemporary painting, most depicting gorgeous, muscular men — one is a blacksmith, another is bound, fetish-style, in chains — in various states of undress. There’s also a great article on The Stranger that delves more deeply into these suggestive images. Pastor Ted, he [Commander Tom] believed, would marshal the shock waves. â€œI think Pastor Ted is Gandalf,â€ said Commander Tom. Tom had received a few mini-visions, just glimpses really, and in them he saw a pastor kneeling, praying, in spiritual battle. For those of you who don’t know, Gandalf was portrayed by Sir Ian McKellen, an openly gay actor and proponent of gay equality. â€œWho’s the Balrog?â€ I asked, referring to a demon that nearly kills Gandalf, the Lord of the Rings’s heroic wizard. I expected Commander Tom to reply with the usual enemies, â€œthe cultureâ€ and the homosexuals and the humanists. But the Balrog, he said, is inside Pastor Ted, and inside every Christian. Before the church can condemn the world, it must cleanse itself, thought Tom; he believed that American evangelicals were filthy with pride. In my opinion, the only way Haggard is going to defeat the “dark and repulsive” Balrog is for him to accept who he is and move on. Those “spiritual advisors” who offer redemption by trying to “straighten” him out are just offering him false hope. Introspection and understanding of one’s self is the true path to salvation. Next Unable to open database error?